Balboa Yacht Club hosted regatta benefitting Children’s Hospital of Orange County. 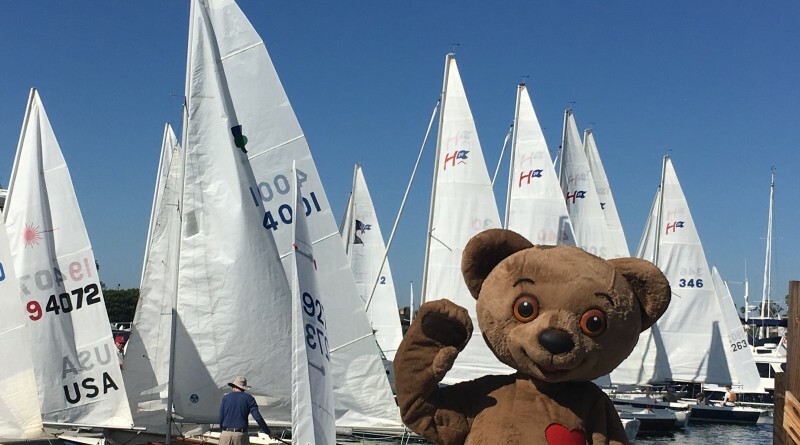 NEWPORT BEACH — The CHOC (Children’s Hospital of Orange County) Regatta earned an all-time high in donations last month, raising $56,000 for the pediatric-themed hospital. Balboa Yacht Club (BYC) along with the CHOC Glass Slipper Guild and their volunteers hosted the 17th annual CHOC Regatta on Nov. 5 and 6. Members of the Balboa Yacht Club (BYC) as well as other yacht club members got together and raised their sails to help CHOC. The weekend began with warm weather and family activities. BYC welcomed everyone to Family Fun Day on the Flag Deck. Children were entertained by Nick the Music Man, face painting, nautical-themed crafts as well as a bounce house. Two of CHOC’s therapy dogs, named River and Lexie, made an appearance as well. Seventy-four boats competed for CHOC in the inside classes Nov. 5. Ten different sailing organizations were represented. Rear Commodore Bill Bloomberg presented trophies to Bob Larzelere in the Thistle Class, Phillip Thompson for Harbor 20 A, Tucker Cheadle for Harbor 20 B, and Ross Watanabe for Harbor 20 C. Martin Bonsager was first in the Laser Fleet, John Papadopoulos in the Lido 14 A fleet and Denise Ogier in the Lido 14 B. Karen Luttrell was first in the Sabot A’s, Elaine Lindhoff in Sabot B and Sammy Hemans in the Junior Sabot fleet. Fifteen keel boats from five different yacht clubs raced in five divisions near the Balboa Pier on Sunday. Bob Kettenhoffen’s Dare in Division A, Staff Commodore Alan Andrews’ Andrews 38 in Division B, Brian Dougherty’s Legacy in Division C, Mark Hunter’s In Appropriate in Division D and Jim Devlin in E. were the winners. The CHOC Cup winner for the largest amount donated to the Regatta was once again BYC member Jim Devling, owner of Campaign II. His dedication to raise funds for this important cause is inspirational. No child is ever turned away for treatment at CHOC. Fundraisers and donations like this regatta benefitting CHOC will help keep this practice in place. CHOC is the first hospital in Orange County dedicated exclusively to treating children, caring for over 210,000 each year. The CHOC regatta happens each year during the first weekend of November. The next event is for November 4 and 5, 2017. Numerous sponsors provide a variety of incentives for bidding on auction items. The ultimate benefits are providing funds for children in need of medical care and enjoying a day on the water in Newport Beach. CHOC Regatta is part of the BYC Sunkist Series, which will continue on the first weekend of December, January and February. Additional information and complete results are available at balboayachtclub.com.